This book is a great collection of ideas that will help you to succeed in business. Although presented ideas are based on common sense, some of them strongly disagree with current usual business practices. Still problem is with current business practices and not with presented ideas. 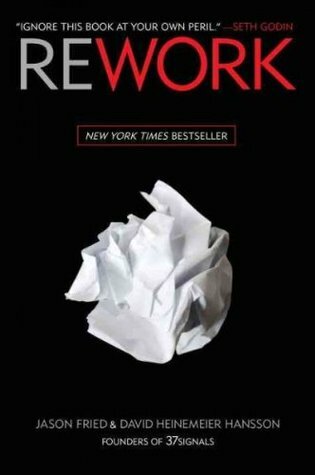 Reading "Rework" can be great motivator for starting work smarter (rather than harder), seeking long-term sustainable business (rather than achieving better financial results for the current quarter) and really serving customer needs (rather then trying to trick him into buying irrelevant product). There are two shortcomings of this book. First, a lot of ideas presented here are taken from another book by the same authors - "Getting Real". Therefore, if you have already read "Getting Real", reading some chapters in "Rework" will be deja vu experience. Second, if you work in "usual" company with no sufficient influence to change its business practices, reading this book can be a serious morale-killer. Anyway, I highly recommend reading this book to everybody (and especially to everybody running some business or thinking about starting one).